One of the main reasons I wanted to visit Orlando during our road trip to Florida was NOT to go to Disney World. I'm so over Disney and theme parks in general. But you see, I had to visit one particular theme park. Not because of the rides, but because of the setting it brought to life for the book lovers. Yes, I'm talking about the Wizarding World of Harry Potter at Universal's Islands of Adventure theme park. The fact that I as a lover of this series could enter Hogsmede and look up at Hogwarts castle was amazing to me. As someone who was initially insistent that I would never read the Harry Potter series, I ended up becoming so enchanted with the vivid world JK Rowling built within the pages of these novels that to stand in this place and witness it come to life was awe-inspiring. I have to thank Allison over at Reading Everywhere for insisting that I listen to the audiobooks. If it weren't for her, I don't think I ever would have ventured into this magical world. As a side note, I have to say that all of the "islands" at Universal Islands of Adventure felt like you were walking on a movie set. The designers and builders of the park did an amazing job of bringing the whole park to life, not just Harry Potter. 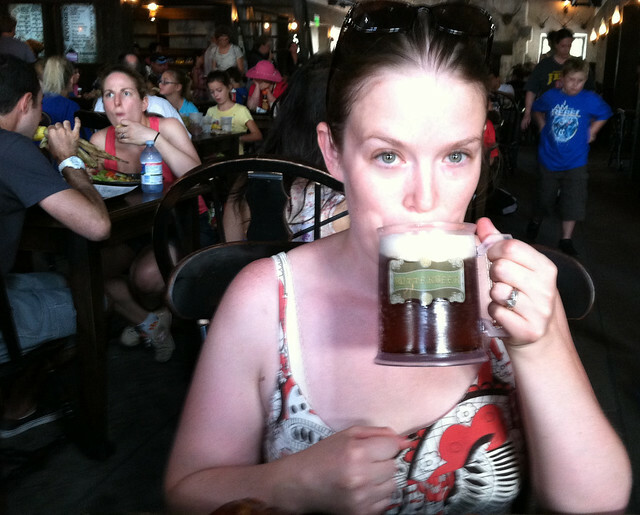 I'm not ashamed to admit that one of the main reasons I wanted to visit the Wizarding World of Harry Potter was to try the butterbeer. When I first read about butterbeer in the books I thought it sounded delicious. I wanted some. 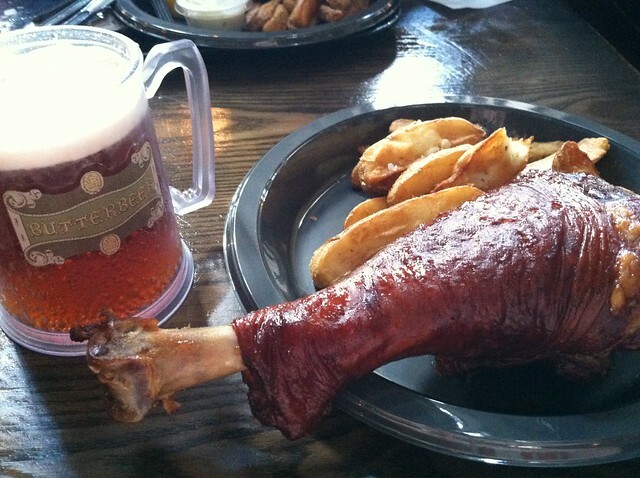 So when word got out that the WWOHP was going to have butterbeer I was all like, "I have to go there!" 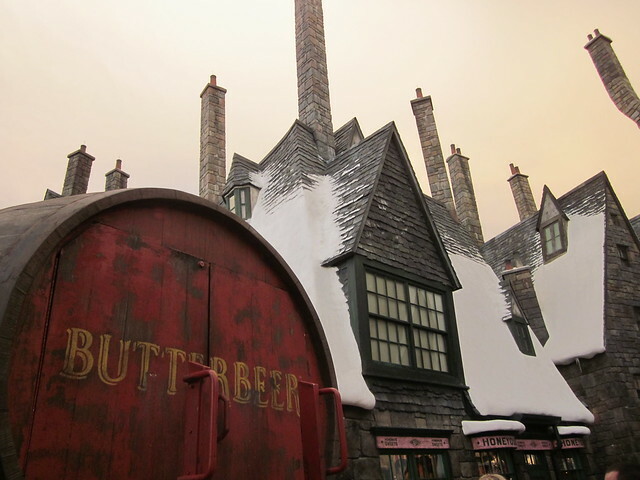 Oh yeah, and I wanted to see Hogwarts and walk through Hogsmede and all that, but no I really just wanted some butterbeer. So was it worth it? Did the butterbeer deliver? I'm here to say that yes it most definitely did. JK Rowling describes her made-up beverage as "less sickly butterscotch." Universal definitely got it right then because it wasn't sickeningly sweet but it definitely had a butterscotch flavor. The best way I can describe it is that it tasted like butterscotch and cream soda with a buttery whipped cream foam on top. It was perfection. I had two glasses. Now I have to figure out how to make it myself because of course no one at Universal is giving up the recipe. I'll have to experiment with some of the recipes floating around on the internet. I think I'll perhaps start with this one. "But Beth," you ask, "what about the rides? Were they awesome?" Honestly, I didn't go for the rides. I know that's a stupid thing to say when you're paying like $90 a ticket to go to the theme park, but I really just wanted to go and experience the world of Harry Potter. Did we ride the rides? Of course we did, but that's not necessarily what I'll remember the most from that day. But if you must know, the main ride, Harry Potter and the Forbidden Journey was cool, but not worth waiting hours in line for. Resist the urge to do any ride with long, multiple-hour waits because chances are, later in the day, it will be much shorter. The best ride in the Harry Potter section of the park was definitely the dragon challenge roller coaster. It had two different coasters that were extremely fast and exciting, and the best part is, their lines were never long so we rode it three times and never had to wait more than ten minutes in line for each ride. 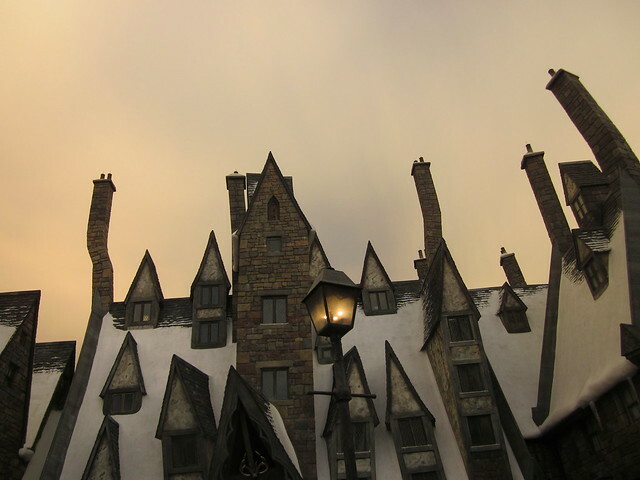 If the line is long, do yourself a favor and skip the Flight of the Hippogriff coaster. We waited over an hour to ride that stupid thing and it only lasted like 20 seconds. Total waste of time. I'll leave you with two final pictures that kind of capture why I wanted to go to the Wizarding World of Harry Potter in the first place. 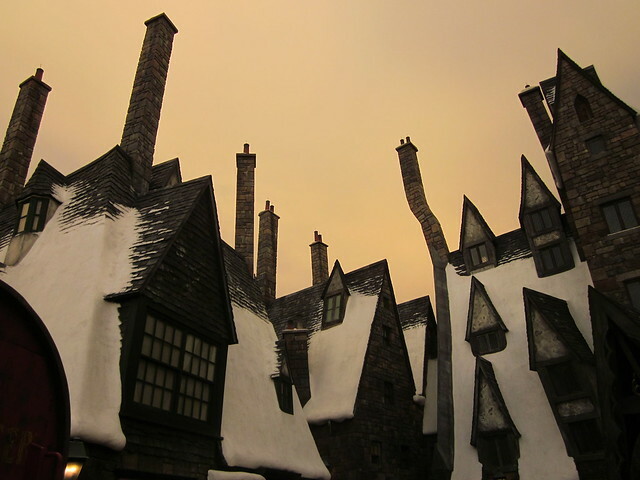 The strange hue of the sky later in the evening made the ambiance of Hogsmede even more enchanting and made you feel like you had really been swept away inside the pages of a book. Isn't that the ultimate dream for all book-lovers? To live inside the pages of their favorite book for a while? Oh fun, fun, fun!! I really want to go there. One of these days. 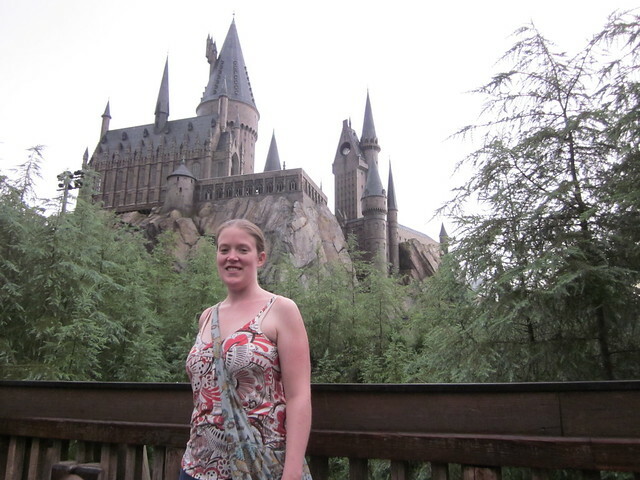 My sister-in-law and her family loved Harry Potter World, it sounds like a wonderful trip. Love your spookily-eerie dusk shot of the park. It captures the spirit of HP, I think. And I'm happy you were able to set aside the widespread belief that amusement parks are there for the rides and strike out on your own. Good job! Now I'm craving butterbeer. Thanks for taking us along on your adventure. Looks like an enchanting place. am I the only person in the world who is not a Harry fan? Love that Harry Potter! Have a great week! 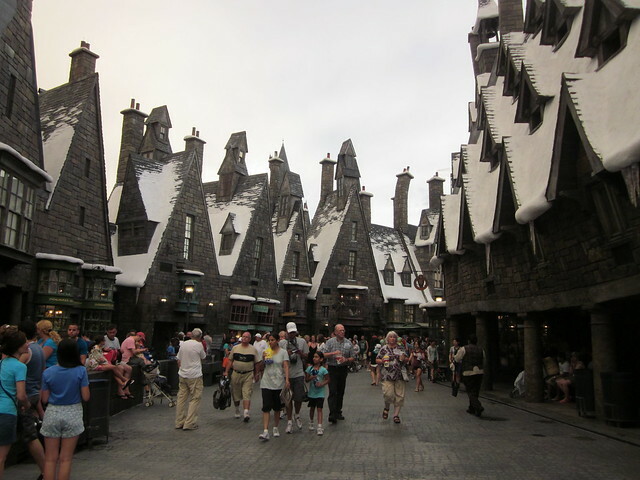 I have to say that I think the only reason I'd go to a theme park in Florida (where it is always TOO HOT) is for Harry Potter. Thanks for sharing your experience & photos! This looks like so much fun! This is coming to Japan in 2014, I am already planning my trip!